The story of David and Samuel begins when Samuel is told by God to go to Bethlehem, to the home of Jesse, to anoint another king to eventually replace Saul. When the sons of Jesse were brought before Samuel, he would have selected the eldest, but the divine whisper checked him. As each of Jesse's seven older sons passed bebore Samuel, the Lord rejected each. 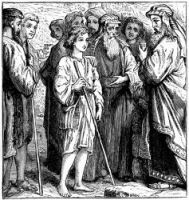 The puzzled prophet asked if there were no other son, and young David was summoned from the sheepfold. At the sight of David, Samuel knew at once that this youth was the one chosen of God to be His king. 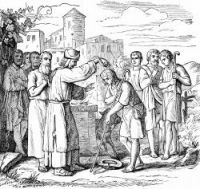 So the prophet made preparation and anointed David there in the presence of his family, pouring upon his head the horn of oil. This ceremony was no slight matter. Had knowledge of it come to Saul, he might have slain not only David and Samuel, but David's entire family. Indeed the prophet had gone to Bethlehem under pretense of making a religious sacrifice, and the anointment of David was not made before the general public. Even David's own family may not have known the true import of the ceremony. They continued to look upon the youth as a mere shepherd boy, not as a future king. David himself might not even have been told at first for what purpose the Lord had chosen him. Yet his heart was at that moment set upon the future, and his meditations turned to high and noble things. These images of David and Samuel are taken from my collection of antique Bibles and story books. You're welcomed to use these pictures of David and Samuel in your artistic creations. 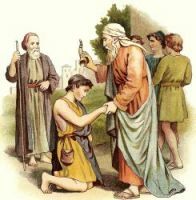 Click on the David and Samuel illustrations below to see more details about saving a free David and Samuel image or about purchasing the images of David and Samuel at a higher resolution.